Sweet potatoes are one of my favorite foods. Sometime when I was in high school (man that was a long time ago), my mom came across a recipe for roasted root vegetables. Before that, we used to bake whole sweet potatoes and eat them plain or with a little butter and brown sugar. The roasted root recipe, however, allowed for the addition of other vegetables — think carrots, parsnips, turnips, potatoes, beets, shallots — as well as spices (cumin works well). 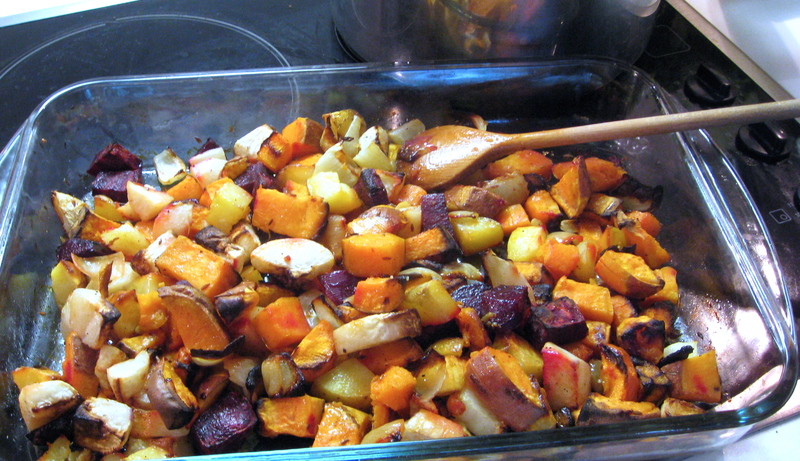 The first pan of roasted root veggies was a revelation. I took it upon myself to continue roasting, and now it is one of my favorite ways to eat winter’s hearty root vegetables. They are good cold, too; during my senior year of college I would roast a pan of veggies on a Sunday and then keep the leftovers in the fridge for quick post-sports practice dinners. One of the best things about this “recipe” is that it can be infinitely varied and customized in terms of ingredients and flavors. F and I have roasted cauliflower and Brussels sprouts with cumin seeds. We roasted carrots alone for this salad last summer. I have roasted just sweet potato chunks and garlic cloves. You can roast a combination of veggies with Italian seasonings (oregano, rosemary, tarragon, etc). I will provide you with a basic outline below — it’s up to you to create your signature combination! Preheat the oven to 425F/218C. Chop your veggies into equal-sized chunks. Put them in a baking dish and toss with a generous amount of olive oil and your spices of choice. Put in the oven and bake for 45-60′ or until the veggies are soft to your liking. Stir them every 20′ or so. Once the outsides of the veggies become browned, you can turn the oven heat down to 400F/205C for the remainder. This entry was posted in community, family, food, health, pictures, recipes and tagged sweet potatoes on 15.01.2013 by taplatt. I think the key to the roasted veggie deliciousness is surface area in contact with oil. I have to mentioned that in addition to all these delectable options listed roasted kohlrabi has become my absolute favorite. Smoked paprika is my preferred spice pairing. You should totally try it! While its not a root vegetable, I feel like kohlrabi is kind of an honorary root. Thanks for the ideas, Bailey! I am not familiar with kohlrabi at all, I must say…but I shall seek it out and try it with paprika.